Amar I. Saini is the managing principal at HnC Smart Solutions, a risk management advisory firm based in Atlanta, Georgia. Amar oversees and coordinates the firm’s range of consulting practices, including, governance, risk and compliance, technology consulting, technical staffing and data management and advanced analytics. Saini has more than 30 years of experience within the financial services industry working with some of the leading organizations in the industry to enhance business performance through risk management, operational effectiveness, enhanced governance and application of technology. Prior to HnC Smart Solutions, Saini was the Managing Director and Head of Enterprise Model Risk Governance at BMO Financial Group. 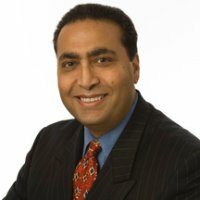 Prior to BMO, Saini held several executive roles including, Managing Director and Head of Enterprise Counterparty Credit Risk Operations & Analytics at Wells Fargo & Co. where he led the strategic overhaul of the firms CCRM infrastucture and the BCBS 239 data management initiatives and Head of Global Risk Infrastructure & Risk Analytics at Ally Financial, Inc. among others at Fiserv, Inc., Experian and Asea Brown Boveri (ABB). Saini attended the University of Greenwich, where he earned a bachelor’s (honors) degree in engineering and the University of Bradford, where he earned a Masters degree in Engineering.